Wool carpets and rugs can be a great investment for your home as long as you take care of it properly. Since wool is a little thicker than most carpet or rug materials, it locks in more dirt and debris. However, wool rugs do introduce some unique cleaning concerns compared to cleaning wall-to-wall wool carpet. Except on very rare occasions wall-to-wall carpet will be made in a factory where conditions are controlled using the latest technologies in manufacturing and dyes. When it comes to crafting rugs, that assumption cannot be made. It is possible that the rug in Mrs. Jones’ living room is a machine made olefin rug worth $80 at the local department store, or it could be a hand knotted Bashir that was made by a nomadic tribe in Afghanistan, worth tens of thousands of dollars. There is a big difference in the way you treat them! Pro: Wool responds very well to cleaning, moisture makes the fibers swell which allows the release of dirt. Pro: Wool is fire safe! Due to wool being a natural flame retardant and higher ignition temperature, wool carpet and rugs are a lot safer than most of the other types of carpets. Pro: Wool is very absorbent and reacts well with dye techniques. Pro: Wool is naturally stain resistant. Wool protects sheep from the natural elements, and so it will protect your carpet from those small spills and accidents that are bound to happen. Pro: The natural crimp makes wool an excellent insulator. Con: Wool is very sensitive to chemicals, mostly those that are found in cleaners (but not in Zerorez!). These chemicals can cause discoloration and also cause the wool to become brittle. In order to clean wool effectively you will need to use a water-based cleaning solution. Vacuum at least once a week, but make sure the height of the brush is set on “High” to make sure you don’t agitate the wool fibers. Clean up spills immediately. For best results, blot up as much as possible with an absorbent white towel, rinse with cold water and dry immediately with a towel or cold air fan. Do not use hot water to clean wool carpets or rugs for this will cause it to smell like “wet dog”, and do not rub or scrub when cleaning, this might cause permanent damage to the wool fibers. Have your carpets cleaned professionally at least once a year. It is important to make sure that the professional has the right training, if not then they can cause serious damage to your wool carpet and rugs. Here at Zerorez Oklahoma, we are certified by The WoolSafe Organization to clean wool carpet with our green, chemical-free empowered water. We follow the international cleaning standard so your warranties for wool carpet will be maintained. The WoolSafe Organization has run an international certification program for professional and consumer carpet maintenance products since 1991. 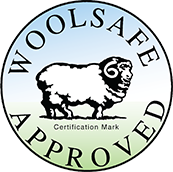 Products are independently tested to WoolSafe Standard WS 1001 and those that meet the performance requirements are issued with a Certificate. All products currently approved are subject to annual re-evaluation to ensure they continue to meet the WoolSafe requirements. Testing and certification is carried out at the head office in England. More information can be found at www.woolsafe.org/usa. We Lower the Temperature of the Water. Your heat should be turned down, not to exceed 150°F, as you can “cook” the fiber causing the epidermis to become brittle and eventually break off. No Aggressive Agitation. We use the softest brushes and do not over agitate. A process called felting can occur with alkalinity, heat and/or agitation. Felting is where the outer scales of the wool fiber interlock with the surrounding scales of other wool fibers and become entangled. This condition is permanent and cannot be corrected. We Increase Dry Strokes and Place Fans Immediately. Due to wool’s high absorbance of moisture it takes longer to dry than other fiber types. Additional dry strokes and using your fan will aid in shortening this. A recent trend by wool carpet manufacturers is a resurgence of jute backings. Using natural materials such as jute will increase the chance of cellulosic browning and shrinking. We check the back of the carpet prior to cleaning to know if this will be a concern. If there is no jute (or other cellulosic) used, browning will not occur.